​​​​ AUSTIN – Much needed supply has been, and is being, delivered to market. However, almost 50 percent of this new supply is large Class A tilt-wall facilities. 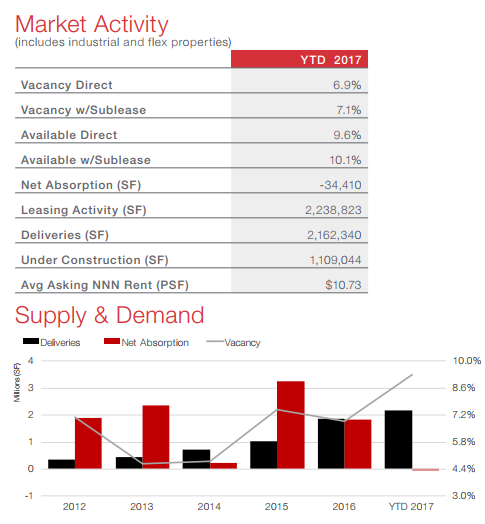 Overall, new supply delivered during 2017 stands at 2.1 million sf, with net absorption dipping into the red, pushing vacancy up to 7.1 percent year-to-date. The current amount of space under construction is 1.1 million sf, with 70 percent of space available for lease. Sales of all major industrial properties advanced 26 percent on a yearly basis during the first half 2017, totaling $201.9 million, signaling strong investor interest, based on Real Capital Analytics data. In addition, industrial properties traded for an average of $109 per sf, on the high end they posted at $141, and they ended at $92 on the low side. Austin jobs increased at a 0.6 percent annualized rate in second quarter 2017. Growth was by and large soft, however manufacturing jobs were strong, and the Austin Purchasing Managers Index suggests continued robust expansion in the sector in second half 2017. The Austin unemployment rate fell for a third consecutive month to 2.9 percent. ​Che​​ck out more industrial stories across Texas.